STAN has an active and enthusiast developer team. Ask a question on the Google group, and you’ll often get a same day (or even same hour) response. STAN does Hamiltonian MCMC via automatic differentiation and principled automatic tuning, so you (1) don’t need to compute any gradients analytically, and (2) don’t need to set any parameters manually! STAN is also wicked fast on some toy examples it was designed for. STAN (version 1.0) does not support *any* sampling of discrete variables. You’ll need to invest human time in marginalizing out discrete variables, esp. for common machine learning approaches like mixture models. Vectorizing the model definition can work wonders, but requires some detailed human knowledge of STAN’s inner guts. Some language features I expected were mysteriously lacking. Punchline: I don’t think STAN is quite ready to be used by Machine Learning researchers as a black-box tool to prototype models. It lacks fine control over when to do discrete vs. continuous updates, and thus scales poorly to moderately sized dataset (it took *minutes* to run 5 iterations on an LDA topic model with just 100 documents and 7000 words). However, I do believe that the automatic approach to Hamiltonian MCMC is sensible, and hopefully down the road this package might be more viable. Read on to see detailed comments and code examples. 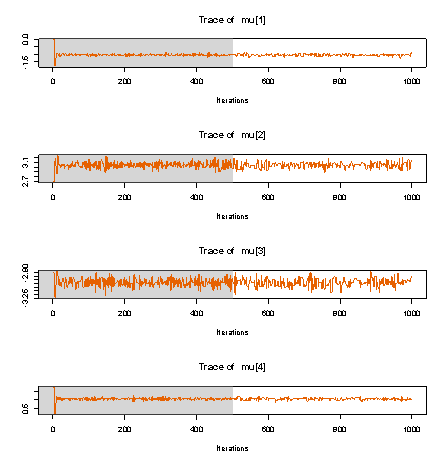 To get my feet wet with STAN, I first attempted a standard Mixture of Gaussians model. The inference problem is to find the hidden mixture parameters and data-specific assignments given observed data . We’ll assume fixed variance parameters throughout this example, though STAN certainly supports inferring these as well. Unfortunately, this specification *does not work* in practice! The problem is that STAN cannot handle the unknown since they are not continuous. The solution is to integrate out these discrete variables. Now, we’ll just open up R with rstan properly installed and run inference on this data!